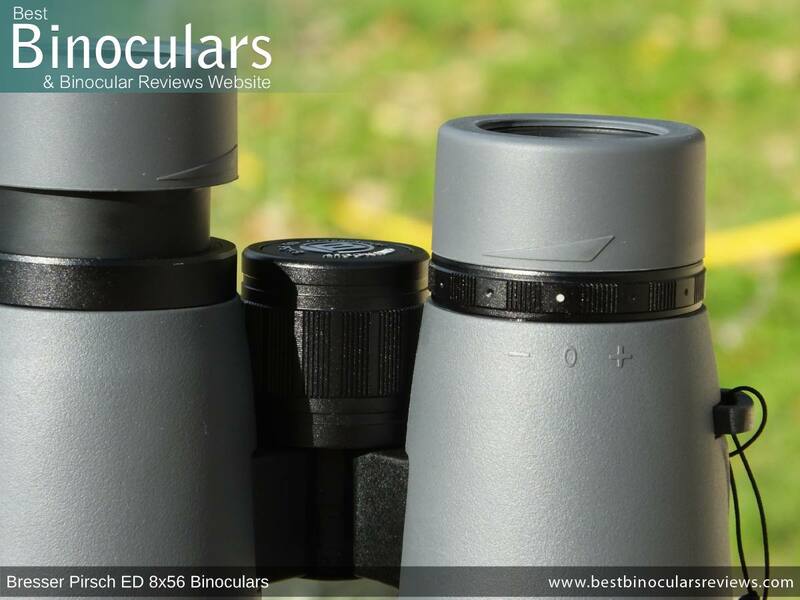 The 8x42 configuration has long been the standard, or seen by many birders, wilder life observers and general optics users as the ideal compromise between light gathering ability versus size as well as magnification versus the field of view and is why is has become so popular. However, I have increasingly been seeing more and more 8x56 binoculars on the market which is really interesting. Compared to an 8x42 binocular, the emphasis shifts a little more towards image quality and low light performance, whilst you sacrifice a little in terms of size and weight. For manly users including wildlife observers, hunters and especially birders, where your subjects are most active at dawn or dusk or perhaps you operate in a thick forests where the available light is not ideal, this improvement is of great importance. The Pirsch ED Series from German brand Bresser sits just below their flagship Montana range and as you can see from the main features below contains an impressive array of features and components. There are currently five models within the Pirsch ED series, all of which have an open bridge roof prism design and range in size from 34mm to these large 56mm lenses. 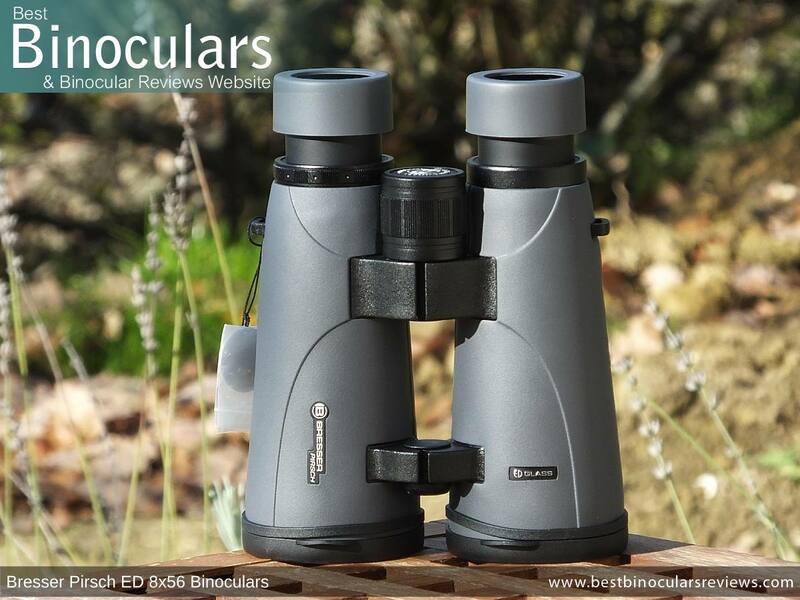 Whilst a little wider and longer (less than expected) than your standard 42mm instrument, the overall design and shape of the Bresser Pirsch ED 8x56 binocular is very typical for that of an open bridge roof prism binocular. The main difference being that rather than a straight tube, the barrels flair out at the ends in order for them to accommodate the larger 56mm objective lenses. In some cases, this open bridge design can lead to a weight saving, however, this is not always the case. What I do like about it though is that the gap between the bridges makes for a comfortable and very secure place with which to carry your optics. This is especially important, if like me you don't always use the neck strap and often cover difficult terrain where it is necessary to carry your bins using only one hand. Another aspect that I like is just how deeply the lenses on these Bresser Pirsch binoculars are set back into the ends of each of the barrels. I measured the depth to be 10mm on my sample. This provides the lenses with a good level of protection. This includes physical damage, like when you rest the binoculars down lens first without replacing the covers (which you shouldn't) and it helps prevent dust or light rain from getting on the glass, which means you have to clean them less often. The underside of these Bresser Pirsch 8x56 ED binoculars is very plain and they lack any thumb indents that you see on some instruments. This is in noways a major issue, but they can be nice in that positioned correctly they just encourage to hold the optic in the right way and at the right point in order to achieve a nice balance. Other than a few small details like the metal rings near the eyepieces, the focus wheel, and the bridges, there is a rubber armor that covers the entire exterior surface on these Bresser binoculars. The rubber that they have used is very hard and relatively thin. This combination does mean that it presents us with less grip and less impact protection than you get with a thicker, softer rubber exterior. However based on my experience, on the positive side, it does mean that this type of rubber housing is less likely to get damaged and perish over time. To increase the grip levels, Bresser Optics has added a very fine texture to the surface, although, this is much finer than on some and so whilst it does make for a less reflective surface than a completely smooth one (good for stealth), the actual grip improvement is minimal. Whilst the bridges are most certainly made from a metal, the housing on all the Bresser Pirsch ED binoculars is made out of polycarbonate plastic (PC). From medical devices to automotive components, greenhouses, to bullet-proof glass, CDs, DVDs, and Blu-ray discs, PC is used in a wide range of areas as it has many desirable qualities that include a high impact resistance, excellent heat resistance, it is strong and is relatively lightweight. 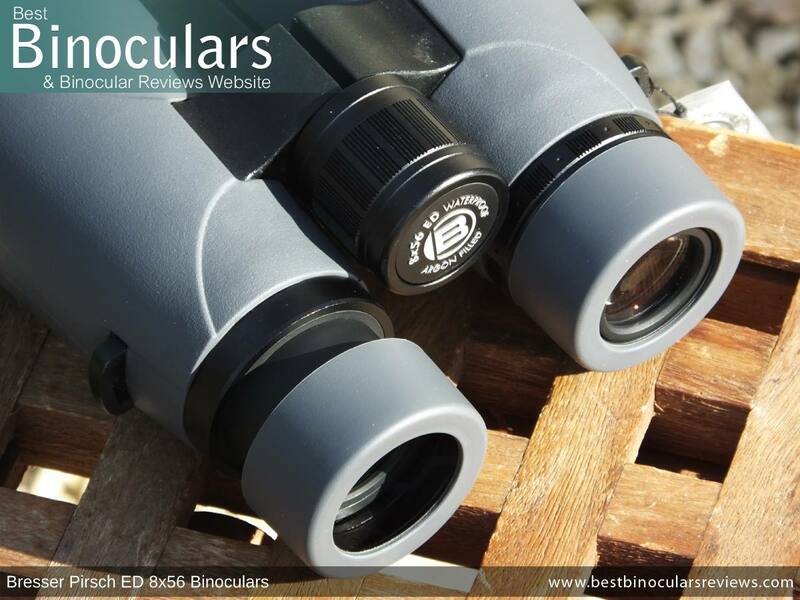 For the binocular manufacturer, it is also easy to mold into the desired shape and costs less than other common alternatives of magnesium and aluminum. The interior cavity of the chassis is sealed and completely airtight and thus impervious to dust and water. So whilst Bresser do not give us a recognized standard or indication of depth, I am sure that for most normal uses in wet weather conditions, they will be fine. To prevent the internal optics from fogging, the air inside the chassis is replaced with moistureless gas. What is interesting is that Bresser has used Argon gas and not the more commonly used Nitrogen. Argon is said to offer a number of benefits over Nitrogen. For example, Argon molecules are larger which means that they are less likely to escape over time. You can read more on this in my article on fog & waterproof binoculars. As you can unscrew and remove the cap at the center of the front hinge which then leaves a hole with a standard thread used by most standard tripod adapters, these Bresser binoculars are technically "tripod adaptable". However as is the case with many larger diameter binoculars that I have tested, the flaring of the barrels at the end, means that there is less space between them and this then means that not all tripod adapters will be able to fit in the gap. This was the case with my adapter, but I do know that you can get thinner adapters that will then work. Failing this and if you must have your optics fixed to a tripod, there are other methods. These include brackets like the Zeiss universal tripod adapter that wraps over the binocular, or you can also use a tripod clamp. You can read more about these and other types in my section on tripod adapters. These Bresser Pirsch ED 8x56 binoculars and indeed all other models within the series have metal (probably aluminum) eyepiece housings. This is important to note because to save costs many manufacturers will use plastic. I think for the chassis this is fine, but this is the area on a binocular that most often gets damaged or broken when a binocular is accidentally dropped and so I was happy to see that Bresser have not chosen to reduce production costs in this vital area. Another major benefit is that the action on twist-up style eyecups almost always feels better, is more robust and has less "free play" on binoculars that have metal eyepiece housings and once again I can happily report this to be the case on my sample Pirsch ED. The twist-up and down action on these is very smooth, but if I was being very picky, I would say it is a fraction to light, meaning that should you want to have them positioned at a point other than the three designated click stops, you have to make sure not to push the binoculars too firmly against your face otherwise they will just twist downwards. 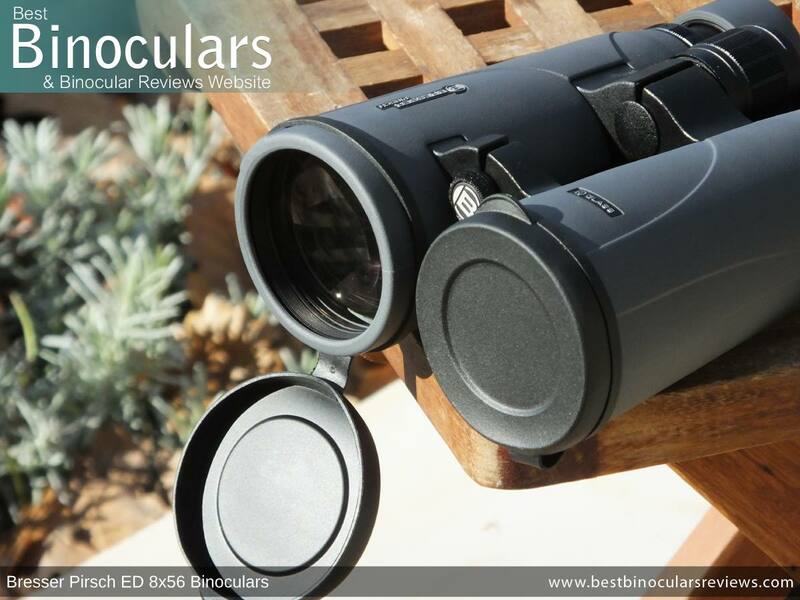 In defense, the three click-stops are very secure and in combination with a very generous 19.67mm of eye-relief, this should be more than enough for most users and makes these binoculars a great choice for eyeglass wearers. By closing the hinges, I measured the minimum IPD to be 6.5cm and then opening the hinges, measured the maximum to be 8cm. This actual IPD range is close to what I would have expected and indeed is good for this size binocular meaning that it will accommodate a wide range of faces, but especially those with slightly wider set eyes. 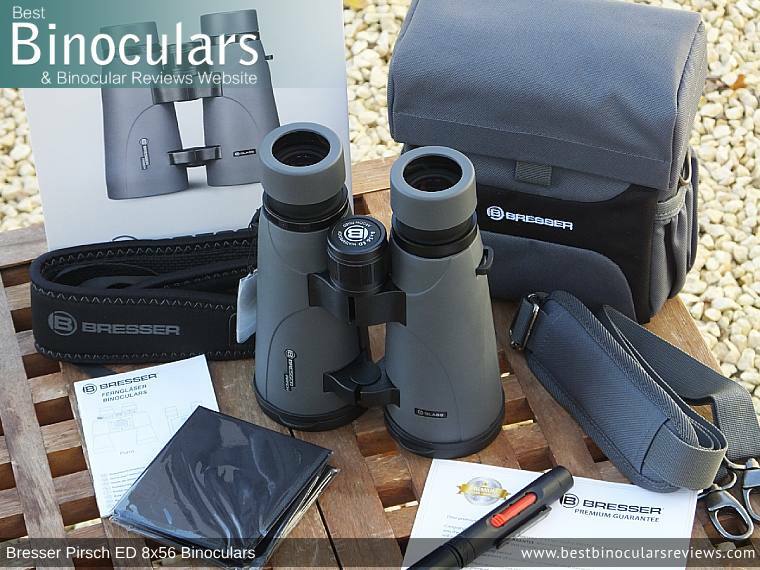 The action of focusing and the actual focus wheel on my sample 8x56 Bresser Pirsch ED binoculars was a particular highlight for me during my time spent using them. As is normal, the wheel itself is positioned at the pivot point on the rear bridge. This location and the fact that the focus wheel has a relatively large diameter (30mm) and the barrel on it is fairly long (32mm) makes it very easy to reach, even if you have smaller hands. I like that the wheel is made out of metal and not plastic as is becoming more and more common these days, even on more expensive instruments. The focusing action on my sample was extremely smooth and there was no sticking points or free play anywhere along the focal range. Speaking of which, it takes just over two full rotations of the wheel (720°) to move from one extreme to the other. This is a fairly low gear, meaning that fine-tuning the focus is a little easier, but it requires more turning to make large focal adjustments than on binoculars that have more aggressive gearing. 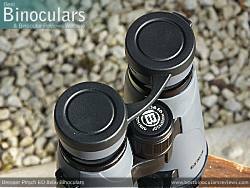 As with the vast majority of binoculars, the diopter adjuster consists of a ring that you can turn which is located on the right eyepiece. Used to calibrate your binoculars to match your precise vision by compensating for any differences between your right and left eyes, it is not often that you have to use it because once set you should not have to make adjustments unless your vision changes, or if you share your optics with another person. The diopter on this Bresser binocular allows an adjustment +/- 4, which is about average in my experience. Whilst it is not lockable which is the best solution, it is good to see that the ring on these Bresser 8x56 Pirsch ED binoculars has a good level of resistance so as to prevent it from being moved by accident. These 8x56 Bresser Pirsch ED binoculars weigh in at 34.6ozs (981g), which is which as you can see from the comparison table below is a fair bit heavier than your average 8x42 binocular and a little heavier than most 50mm instruments. However, when compared to the other 56mm binoculars that I have tested and reviewed, these rank as one of the most lightweight. This is where we can see the advantage of using an open bridge design and whilst the polycarbonate chassis may not be quite as strong as magnesium, it does make for a more lightweight device. As for the dimensions, once again it is no surprise that due to the larger 56mm lenses these Bresser's are more bulky than your average 42mm binocular. But what I immediately noticed when I unboxed them and what is confirmed by their specifications is that the difference is not massive. Indeed, as you can see from the table above, these Bresser Pirsch ED binoculars are about as "compact" as it gets for a 56mm binocular. Worried about the extra size and weight? 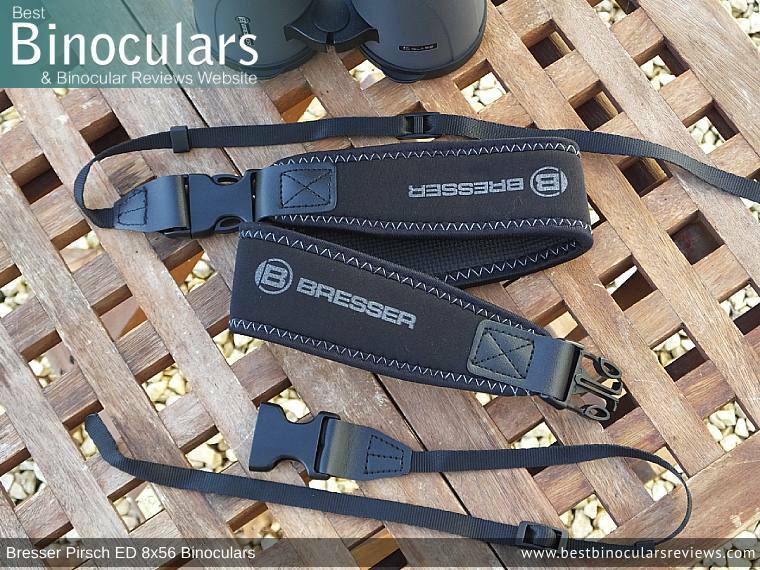 As you can read in the accessories section below, these Bresser's come with a truly excellent quality and extremely comfortable neck strap which is great, however, what is even better is if you combine this instrument with a really good binocular harness. Whilst testing this Bresser Pirsch ED, I also happened to be testing out the excellent Cotton Carrier Skout Harness, at the same time which has now become my all-time favorite harness. I won't go into details here, you can read the view if you want to, but what I will say is that even though she knows that the low light performance and image quality is reduced, my wife almost always opts for a smaller, more lightweight binoculars (either a compact or at most a 32mm mid-sized binocular). But after trying out the Skout Harness, with these 56mm binoculars and the even larger and heavier Steiner Nighthunter 8x56 binoculars, she has changed her mind. Sure, when the light is good or if we are traveling, she will still use a smaller instrument because that is the right choice for that situation. But in low light, she now has no hesitation in using these as with a harness the added size and weight penalty is really not much of an issue at all. Firstly it tells us that they are 56mm in diameter. As we have already spoken about, for a binocular that is primarily designed to be used from the hands, this is considered large. The advantage here is that the larger surface area has the potential to capture and let in more light (think of big versus small windows in your house), with the result being a higher quality and brighter image. They will also perform better in low light than a smaller binocular with the same magnification. The disadvantage of this is that they are obviously bigger and heavier, which in turn makes for a more bulky instrument, although as you can see in the Weight and Dimensions section above, both were less of an increase than what I had expected. The lenses on the Bresser's are made up of a number of elements, one of which has extra-low dispersion (ED) properties that have the potential to offer a number of advantages. The most important is that they can reduce chromatic aberration, which if used in a well designed optical system can lead to a view that shows less color fringing. For more on how they actually performed in this area, take a look at the Optical Performance section below. Arranged into 4 groups with 3 pieces and with the outer lens measuring 24mm in diameter, the ocular lenses on these 56mm Bresser Pirsch binoculars are nice and large. 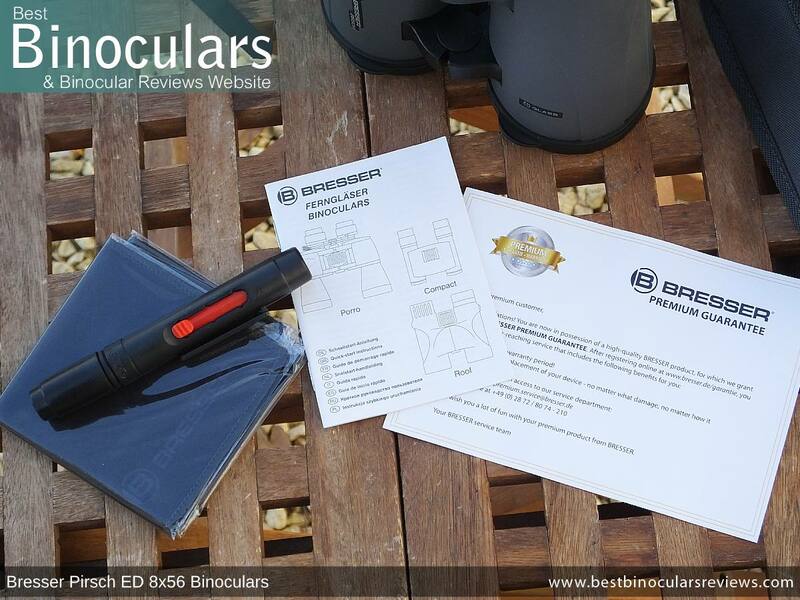 Firstly it makes it easier for you to line your eyes up with them, which when combined with their very large exit pupil, makes these binoculars make it super easy to set-up and use the binocular without black rings forming around the edges of the view. I think this is an understated aspect of a binocular and I do think is worth dwelling on as a binocular with small oculars, low eye-relief and a small exit pupil makes it much harder to use as you have to adjust the IPD setting and push your eyes against the oculars very precisely to prevent these black rings, which can make an instrument very frustrating to use. 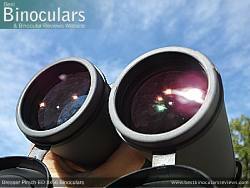 For more, take a look at my article on ocular lens size in binoculars. 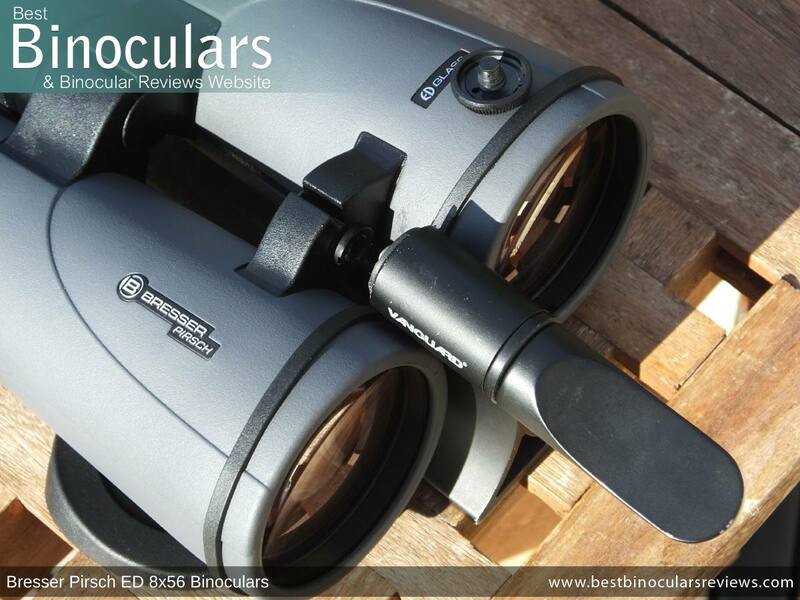 These Bresser Pirsch ED 8x56 Binoculars use Schmidt-Pechan roof prisms to invert the image, which has become popular in modern times, largely because it helps to produce a more compact shape of instrument. Bresser Optics state that their prisms are made using BaK-4 (Barium-Kron) glass, which is good as it is usually deemed a better option for use in binoculars than BK-7, which is the other commonly used optical glass. Along with the large objective lenses, another very important contributor to a bright, high-quality view is the level and quality of coatings used on all the glass elements within the entire binocular. Whilst we cannot compare the process or the exact makeup of the materials used in the coatings as this is often a closely guarded secret, we can check to see how many elements are treated which is a massive indicator as to the quality of the binocular as a whole. Lesser instruments will only have some surfaces coated (Multi-coated), whilst others will only have a single coating on all surfaces (Fully-coated). So here it is good to see that the Bresser Pirsch ED binoculars are advertised as being are Fully Multi-Coated, which implies that every single optical surface throughout the system has multiple layers an anti-reflection material added to them. 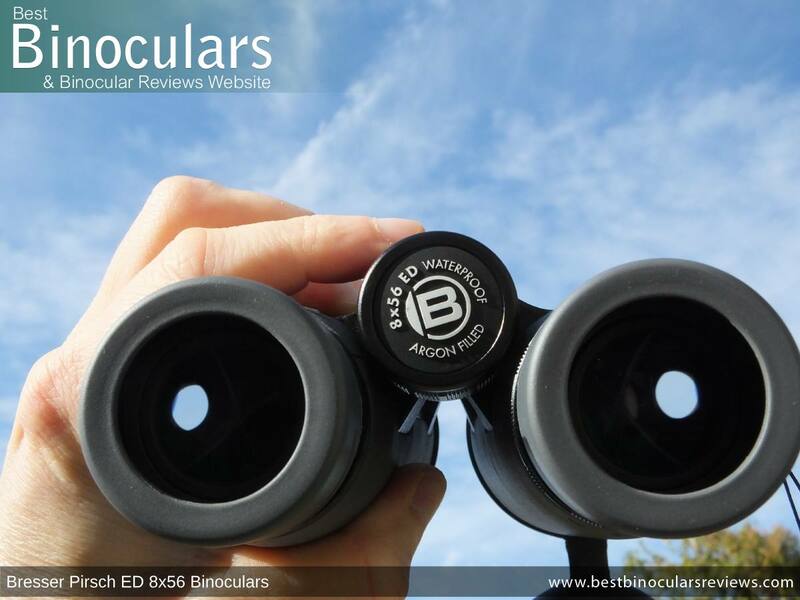 This is one of the most important features of what to look for when buying binoculars as it makes a huge difference to the brightness and quality of the view. 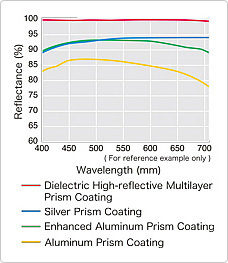 You can also read more on Anti-Reflection Lens Coatings here. Firstly it is very important to note that they are dielectrically coated. This ensures that over 99% of the light (in all wavelengths) that reaches them gets transmitted. At this level, I would have been shocked if they had used aluminum mirror coatings as is the case with many lower-end instruments, but there are plenty that do use less expensive silver mirror coatings, which is good, but nowhere near as effective at reflecting all the wavelengths of light throughout the entire visible spectrum as the dielectric ones used on these. Next, Bresser has also added phase correction coatings onto the prism to ensure the separate wavelengths remain "in step" whilst and after passing through the prism. These are important as you get a much-improved image resolution and contrast than roof prism binoculars that omit these. 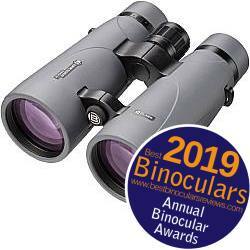 These 8x Bresser Binoculars have a view that is advertised as being 114 m wide when measured from 1000 meters away, which is roughly 378ft at 1,000 yards in old money. This also translates to an angle of view that is 6.51°. Whilst by no means bad, this is somewhat less than 8x binoculars that I would describe as having a wide angle of view. During my use and testing of these, you can notice it when comparing them to a bin with a wide view, but I did not feel that the view was excessively narrow. But I would add that if you specifically requiter an instrument wide view, then these may not be the right choice for you. The advertised minimum focus distance on these is 3.5 meters (11.5ft), which I have to say is very conservative and they are doing themselves and injustice here as I could obtain a sharp focus on an object from 2.65 meters (8.7ft) away. Here on BBR anything under 6ft is considered excellent, so this is good but not excellent. For the user this means that these are fine for the occasional observation of things like butterflies and insects, but these are probably not the right choice if this is your main interest. 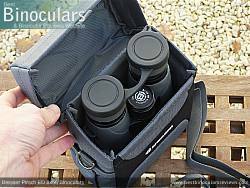 You get a massive 19.67mm of eye-relief on this instrument, which as I mentioned in the eyecups section, should be more than enough for most users and makes these binoculars a great choice for eyeglass wearers. For the majority of the reviews that I write on BBR, I use a benchmark instrument with the same or very similar configuration with which to compare the view through. It is in this way that I am able to rate them in relation to this "constant" and thus helps to keep the observations I make as consistent as possible. 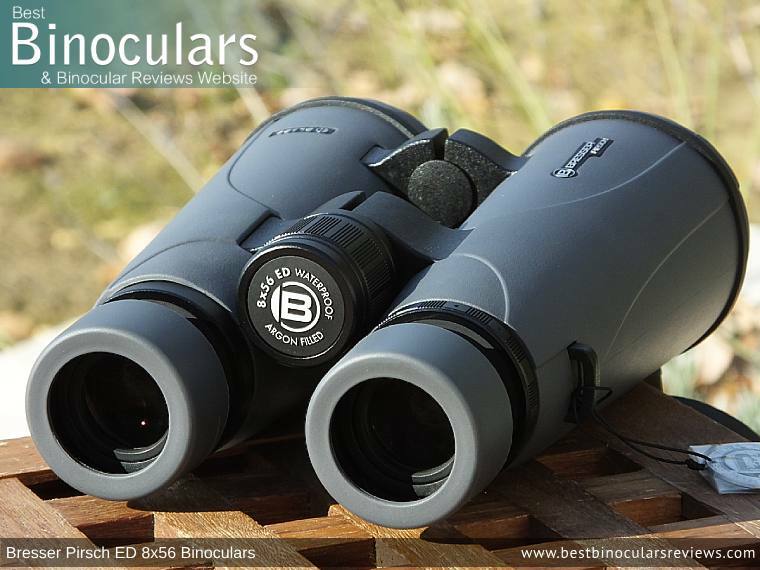 However, I don't have an 8x56 benchmark binocular, so for this review, I compared it to my 8x42 benchmark and as I also happened to have it with me at the time of writing, I sized the view up against one of the very best 8x56 binoculars on the market, the Steiner Nighthunter. In terms of the colors and contrast levels, I would describe the view as being "true to life", which is a good thing. For me, this means that the image is vivid with a good level of contrast, but not artificially so, which can make the view almost look like a cartoon. It is also far better than a binocular whose image is dull and lacking any depth due to a low level of contrast. During the day and in good light and due to the exit pupil being larger than the pupils in your eyes, both 8x42 and 8x56 binoculars are able to supply your eyes with more than enough light for you to perceive a bright image. Thus it was no surprise to me that I found it difficult to spot an obvious improvement between these and my mid range 8x42 benchmarks. Both these Bresser Pirsch ED's and the Steiner Nighthunter's were observably brighter than the 8x42 benchmark, this was especially noticeable as dusk fell. To my eyes, the Steiner's were the brightest, however, I thought that the Bresser's compared very well as it was quite difficult to spot a major difference. This is impressive as with an industry leading 96% level of light transmission in all visible wavelengths, the 8x56 Steiner Nighthunter is certainly one of the very best when it comes to image brightness and low light performance. The primary goal of the ED glass used in the lenses of these Pirsch ED's is to reduce the distortions that cause color fringing. Just simply using ED glass does not guarantee this as it has to be used in conjunction with a well designed optical system and I have often come across a high quality, but non-ED glass binocular that performs better than an average ED instrument. In this case I was not to be disappointed as the level of color fringing that i was able to detect on these was exceptionally low and would say it is about as good as it gets for a bin with an 8x magnification. The amount of softening or "fuzziness" at the edges of the view is also very minimal and I never noted any sort of image distortions or curvature of the image, which is obviously great news. Other than to show the photos, it is not often that I mention the packaging in my reviews, however when it goes beyond the normal or if it is particularly bad then I certainly will. In this case I am happy to report that Bresser's packaging is excellent. 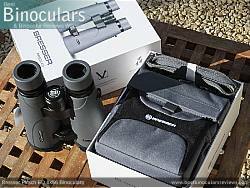 Not to the level that that you get a wooden display box or something like that, but just in terms of its function and just how well the binoculars and all the accessories are packaged. I know this may be a little nerdy, but the fact that it all just fits together without an inch of wasted space to be seen anywhere, really pleases me! By this you can tell that the packaging is far from generic and that it has been specifically designed for this product. It is these small details that add up and which often rise an instrument up from out of the crowd. It is about as far as you can get from the "generic" one-size-fits-all bags that I see all to often these days. Right from the embroidered Bresser logo, to just how well the binoculars sit and fit inside, you can tell that it was made by/for Bresser with these binoculars in mind. The case has a flip over lid design, but instead of the usual strip of Velcro, clip or Zip, this has a magnetic closure system that I feel works very well. In the past I have used bags where they have a small magnetic button, that works, but I often felt that it would open just a little too easily. here Bresser have used a long magnetic strip right across the front of the lid and bag. this not only helps the case keep its nice shape, but also make for quite a strong closure. Sure it is not as secure as a Zip, but in defense, it is far easier to open and makes almost zero noise, which if you are aiming to remain undetected for whatever reason, be that for security or because you are observing timid wildlife is important. As I mentioned, the binoculars fit extremely well inside, if a tiny fraction too snugly. I say this because a tight fit is good in preventing the instrument inside from falling about and whilst you can close the lid with the eyecups extended and lens covers on, the fit is tight. Whilst not having the most amount of padding, the level of padding is certainly adequate for these comparatively large and heavy optics. There are no internal pockets, but I do like the elasticized pockets on the sides of the bags that are great for carrying your cleaning cloth etc. This bag does not have a belt loop, but it does come with its own carry strap that can be adjusted for length, has a shoulder pad and easily attaches onto the metal loops on the sides of the bag with quick release clips. 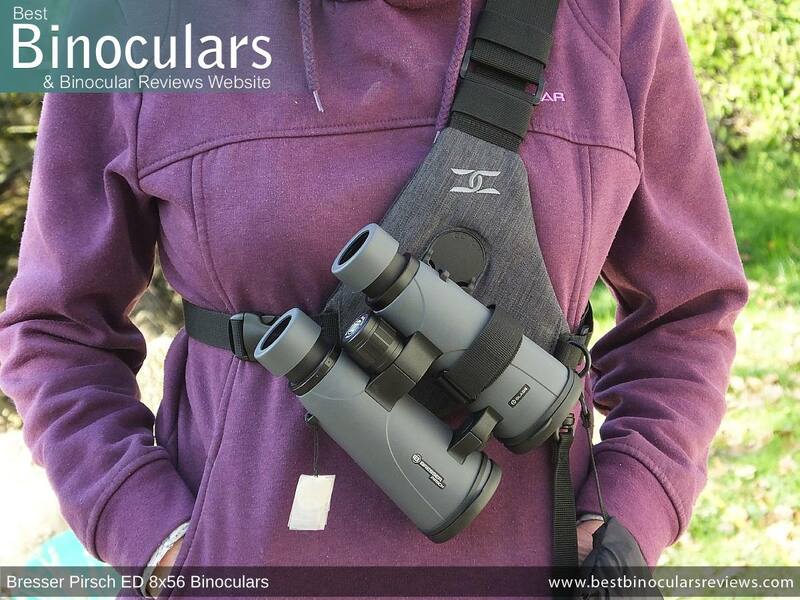 To start with, apart from actually attaching to the binocular in the usual way, it is once again nothing like the generic ones flooding the market and looks very well made using great materials and stitching. Adding to this is the fact that it is extremely well padded and very comfortable. The exposed neoprene underside offers a good level of grip to prevent it from swaying or slipping about over your neck and shoulders. I also very much like the fact that Bresser have included quick-release clips between the padded and un-padded sections. Firstly this makes it very easy to remove it and also makes it easy to attach to many binocular harnesses. They have also made the clips on each side opposite, so that you can easily convert the neck strap into a hand strap by clipping the two ends together once you have removed the padded section. In contrast to the carry case and neck strap, the objective lens covers a quite ordinary and somewhat generic, lacking any sort of branding or flair. However, having said that they work well and fit onto the ends of the barrels securely enough so that they are unlikely to come away by accident. It is a slight shame that the cups don't fit into the ends of the barrels rather than over them as this looks cleaner and usually makes them look more a part of the binocular, rather than just an afterthought. I do like that they are tethered to the binocular so that they remain available and easy to replace after use. The simple rainguard is made from a rubber/plastic that is a little harder than that of the objective lens covers, but even so, because of the flexible bridge, it is easy to attach no matter what you have the distance between the eyecups set at. The cups of the guard fit well over the eyecups, meaning that is is easy to replace and take away, but also does not come away too easily when you don't want it to. So, like the objective lens covers, the rain-guard is pretty basic, unbranded and much like that found on millions of other binoculars, but in terms of the function is perfectly adequate. It was to my surprise and great pleasure to discover that not only do Bresser include a good quality microfiber cleaning cloth as is customary. But with their Pirsch ED binoculars, you also get an excellent cleaning pen that is very similar to the Carson Optical C6 Lens Cleaners that I use on all my optics. In Europe, these come with Bresser's "2-year guarantee" supplied as standard. However, if you register the binocular with them online, they then upgrade it to their Premium guarantee that grants you an unlimited warranty and a full repair warranty for life which I am sure you will agree is impressive. I am not sure what warranty you get in the USA. 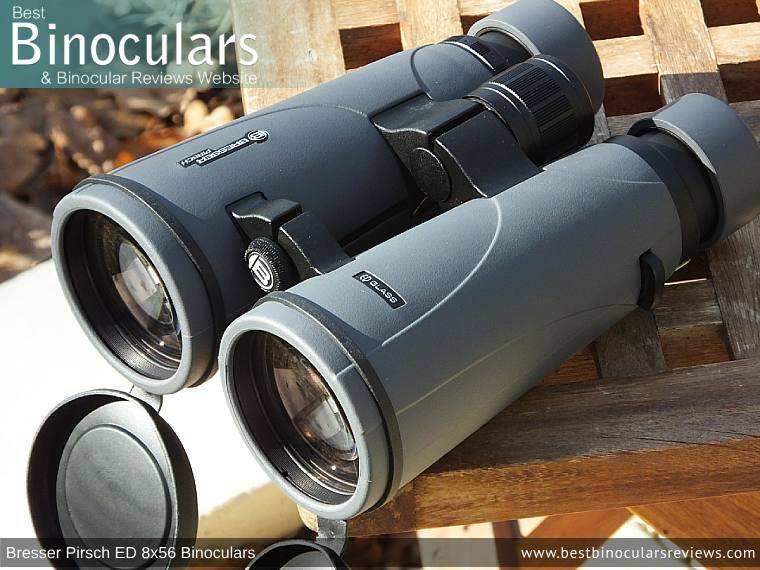 As the scores suggest, there is no doubting that these Bresser Pirsch ED binoculars are an outstanding pair of optics and I really do think that for many users they can make a great alternative to the standard 8x42 for those who are looking for a better low light performance as the size and weight penalty is really not that great. 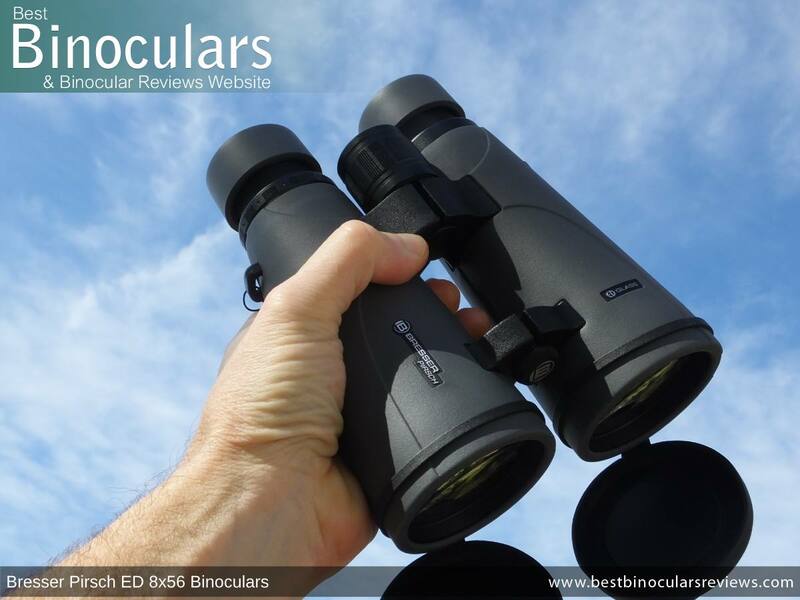 These 56mm Bresser binoculars are not that much larger or heavier than some 8x42s and are certainly at or very near the top of the pile in this regard if you compare them against most other 56mm instruments on the market. The image brightness and especially the performance in low light was very good and certainly means it is the binocular I want to be using in thick woods, overcast days, at sunrise or dusk. The quality of the view is also very good. The have a very good color reproduction and contrast levels, very low color fringing, hardly any image softening at the edges of the view and no other visible distortions. The build quality and function of the neck strap and carry case are both excellent and I also really appreciate the fact that these high end optics come with a good cleaning kit that includes a cloth and optical cleaning pen. This is something that almost every other manufacturer forgets. Whilst not terrible, I would have preferred it if these had sacrificed some of the eye-relief for a wider field of view. For most users, this will not be a big issue, but if you like observing things like small, fast moving birds from close range, a very wide view can make it easier to quickly locate and follow them. Here, the same could be said of the minimum focal distance. Whilst it is not at all bad, it does fall a little short of the very best. For most users this will be a complete non-issue. But if you often observe objects from very close range (Under about 3 meters or 9ft), this will be something to keep in mind. Whilst I have no complaints with the actual function, when compared to the level of the other accessories, the lens covers and rain-guard are a little bit of a let down. 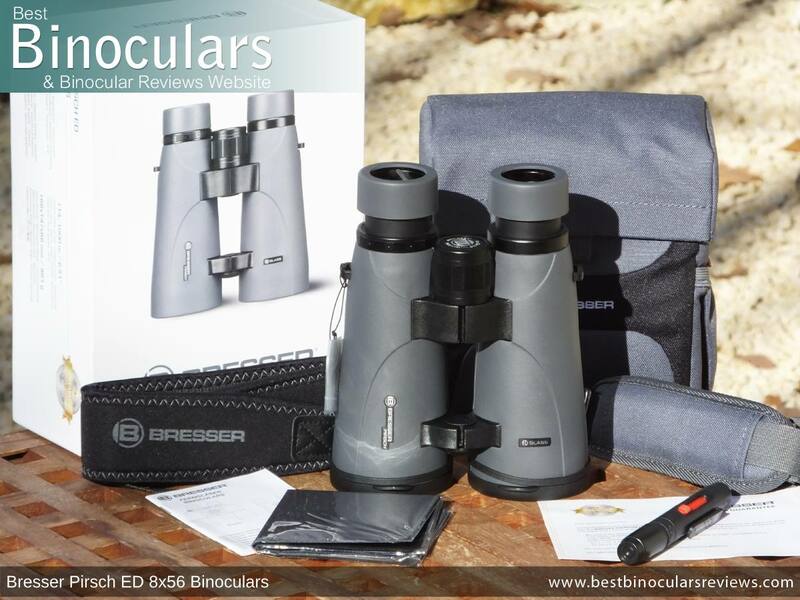 I would like to thank Bresser for arranging a sample of these Bresser Pirsch ED 8x56 Binoculars to be sent out to me to test, for supplying me with additional information and for answering all my questions. I would also like to make it clear that as with every other review I write, the thoughts and opinions expressed on this page are completely my own. I am not paid by Bresser or any other supplier, nor am I obliged to write about their or any other products in any sort of way or with any sort of bias.